Parents these days take a lot of pictures. But as simple as it has become to capture moments, it is all too easy for those moments to get lost in the shuffle, which leads to guilty parents and longing loved ones who want to share in those moments. This was a personal pain of mom-turned-entrepreneur Carrie Griffith, who found herself spending precious hours on PowerPoint trying to customize her baby’s photos with relevant milestones to send to friends and family. 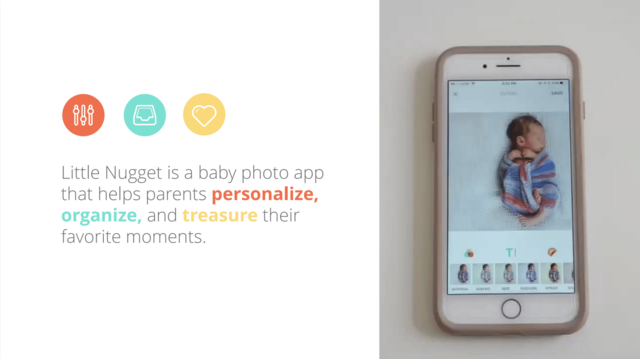 Carrie’s frustration inspired her to start Little Nugget, a baby photo app that makes it easy for parents to personalize, organize, and share their favorite moments. When Little Nugget founder Carrie Griffith came to us, she had a well-built digital product and a product roadmap defined. She partnered with us to understand her users better and learn how to talk about her product both in the market and to potential investors. Little Nugget was one app amongst many in this market, and Carrie wanted to position it in a unique way that resonated with her target audience and cut through the noise. Additionally, most product decisions were being made based on Carrie’s own experience as a parent, so she wanted to understand perspectives and pains from a broader audience and potential users - all in an effort to prioritize product features that solved the most significant problems. We partnered with Carrie to accomplish two main goals: Understand the pains of Little Nugget’s target users, and develop the product positioning necessary to market to these target users with confidence. We started by conducting in-depth qualitative research with parents to gain a deeper understanding of the problems they faced when it came to documenting memories, sharing them with friends and family, and the pains they felt as a result. The challenges expressed by parents provided valuable insights that guided feature decisions in the Little Nugget app, and also equipped our team with the context necessary to accomplish our second goal: Establish clear, unique and relevant positioning that speaks to the buyers’ pains. Equipped with research on parents as well as competitors in the space, we worked with Carrie to refresh Little Nugget’s messaging with the right words to differentiate, provide clarity, and appeal to parents across all stages of the parenting journey. We were even able to channel the parents’ voices into the messaging, using specific challenges and sentiments we heard during the research. Together we generated a new foundational statement, a one-sentence description of Little Nugget’s value proposition, to be used as the north star to guide all future marketing efforts. We also worked with Carrie to generate the product’s messaging pillars by grouping product functionality by the benefits to the user, making it easy to explain the product capabilities and value of Little Nugget. 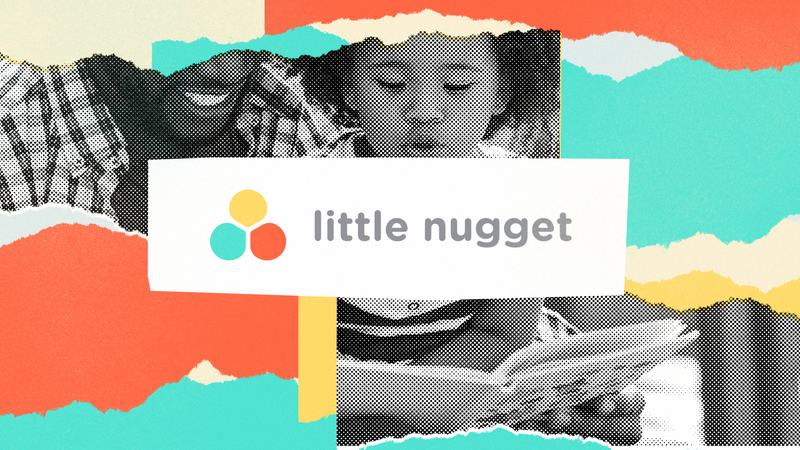 After partnering to gain a deeper understanding of Little Nugget’s target users and using those insights to generate clear product positioning, we translated those updates to a refreshed pitch deck for Carrie to use to socialize her product. The refreshed pitch deck included a section to frame up the research-backed problems that parents face, followed by Little Nugget’s solution with consistent, differentiated positioning and a clear organization of product features by benefit to make it easy to understand the product value. Through our engagement, Carrie Griffith was equipped with a clear understanding of the problems Little Nugget solves for its target users, as well as the messaging foundation necessary to claim a consistent, differentiated position in a crowded market. In just two years, Little Nugget has 152,000 total app downloads and 16,000 app store reviews with a 4.7 overall rating. Carrie supported her well-built app with the foundational research and product marketing necessary to ensure that she could talk about her product in a consistent, unique and repeatable way that resonated with the pains of her target market. When building a digital product, don’t rely too heavily on your assumptions. At some point, it is critical to talk to your users to ensure that your product is addressing their most pressing problems and helping them achieve their goals. Organize your product functionality in a way that aligns to your product’s messaging to make it easy for buyers to understand not just what your product does, but also how it will make their life better. When operating in a crowded space, always keep a pulse on competitors and be willing to pivot when necessary to provide clarity in market around who you are and how you’re different.